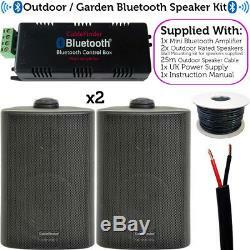 Outdoor / Garden Bluetooth Speaker System. 1x 30W Mini Bluetooth Amplifier 2x 3 60W Black Outdoor Rated Wall Speakers (with brackets) Can be swapped for White if required. 25m Outdoor Rated 1.5mm. 1x UK power supply (12V 2A) 1x Instruction manual. Perfect for Garden Parties, BBQs, Beer Gardens, Decking Areas, The front or rear of work premises, outdoor sections of Restaurants, Smoking areas and much more This outdoor rated, Bluetooth enabled speaker kit can be installed where most cannot. Only one device can be connected to the amplifier at any one time so no one nearby can interfere with your music! Our great value amplifier & speaker kit allows you to have up to 4x (2x supplied) wirelessly controlled speakers that you can stream music to via Bluetooth. This kit includes everything that you need to get this set-up and it is very easy to install. We have tested this kit thoroughly and it is truly impressive how good the sound quality that the amp and speakers produce (especially for its price). Please see below for more. Perfect for a variety of uses as this amplifier can be hidden above kitchen units, in ceiling voids (make sure ventilated and accessible). Once set up and the power is connected, you don't need to touch it again to play music wirelessly. The amp also features mounting holes so can be screwed into place wherever is convenient. Only one of these amplifiers can be connected to your smartphone / Bluetooth device at once. PLEASE NOTE This amplifier is not outdoor rated so it would have be kept safe from the elements. 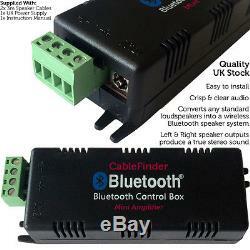 This could be installed within an outdoor rated box as the amplifier is very compact. You will have to remain within 10m of the amplifier in order to transmit a Bluetooth signal. 2-way compact speakers with weatherproof moulded cabinets, making them ideal for gardens, outdoor shelters, health club spa areas and marine applications. Construction Housed in a rugged ABS plastic casing with a subtle, yet durable mesh grille, these speakers will look stylish & discrete in most environments. Each enclosure contains a high quality 1 quality polymer tweeter (double the size of most on the market) and a 3 surround woofer to produce a great sound for such a compact speaker. Fitting There is an adjustable mounting bracket on the back of each speaker allowing you to securely position each speaker where it needs to be. 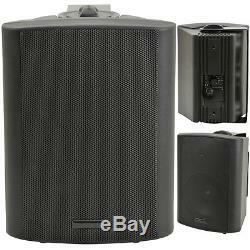 PLEASE NOTE Exposure to direct splashes of water and heavy rainfall should try to be avoided to improve speaker life. These speakers are ideal when sheltered from the extremes that the elements have to offer (like in a beer garden or outdoor shelter/decking area). Weatherproofed IP54 1M hard-wired speaker cable attached to the rear of the unit Mounting bracket included Optional mounting by M6 screw sockets Available in white or black finish 100V tappings 1.5W, 3W, 6W Power RMS (8 Ohms) 30W, Max 60W. 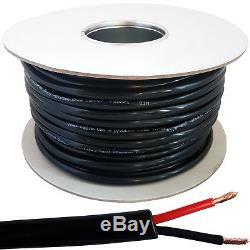 Double Insulated Outdoor Speaker Cable. 48 Strands with a 0.2mm diameter per core. If this all seems a litle too technical for you, then why not get in touch with us.. Were always happy to help and offer advice. All our products are usually dispatched within 24 hours of your order being placed with us Mon-Fri.
You are very important to us and our aim is to make you not only one of our customers, but one of our fans. We're committed to bringing you high quality products. We are specialists in linking up audio and visual equipment. We offer excellent customer service and help when you need it. We normally dispatch orders within 24 hours of receiving your order (Mon-Fri). Please view our Terms and Conditions. The item "Garden Party/BBQ Outdoor Speaker KitWireless Mini Stereo Amp & 2 Black Speakers" is in sale since Wednesday, July 12, 2017.